Is There an Ideal Weight for a Man of 5 Feet, 7 Inches? There isn't one ideal body weight for all men of the same height, since body composition plays a role. Muscle weighs more than fat, so a muscular guy could weigh more than a man of the same height who carries much of his weight as fat. You can, however, use a number of methods to determine whether your weight and body composition puts you in the healthy range, which would be somewhere between 121 and 163 pounds, depending on which method you use. The best person to talk to about your weight is your doctor; these methods are just estimates. One way to calculate the ideal body weight for a man is to start with 106 pounds for the first 5 feet of height, and then add 6 pounds for each additional inch. Then, to allow for differing frame sizes, add or subtract from this weight to determine an IBW range. The ideal weight for a man with a medium frame who is 5 feet, 7 inches tall is: 106 + (7x6) = 148 pounds. A man with a small frame should subtract 10 percent of this weight, or about 15 pounds, to get an ideal weight of 133 pounds, and a man with a large frame adds 10 percent, to get an ideal weight of 163 pounds. Using this calculation, the IBW range for a man who is 5 feet, 7 inches tall is 133 to 163 pounds. You have a small frame if your thumb and finger overlap when you use them to circle your wrist, a medium frame if they meet, and a large frame if you see a gap. This type of calculation gives you a general idea of your IBW, and although it doesn't take body composition into consideration, it allows for differences in body frames. Doctors often use body mass index, or BMI, as a way to estimate whether or not a person is at a healthy weight. A BMI between 18.5 and 24.9 is considered normal, a number below this range is considered underweight, and a value above this is considered overweight. For a man who is 5 feet, 7 inches tall, healthy weight ranges from about 121 to 153 pounds. Neither BMI nor ideal body weight calculations are perfect because they can't measure how much body fat or muscle someone has. Most of the measuring methods are relatively expensive and not widely available outside of hospitals, such as underwater weighing, dual energy X-ray absorptiometry, the BodPod and bioelectrical impedance analysis. Skin calipers can be used to assess body fat percentage, but measurements must be performed by a trained professional. Scales that measure your body fat percentage through bioelectrical impedance aren't especially accurate. BMI tends to overestimate body fat in people who are very muscular and underestimate it in people who don't have much muscle, such as many elderly individuals. It's possible to be in the healthy or normal weight range and still have an unhealthy percentage of body fat, a condition called normal weight obesity that can increase your risk for a number of health conditions, including heart disease. Men shouldn't have more than 25 percent body fat to be healthy. People can fall into the healthy BMI range with a body fat that is not healthy; for example, in a study published in The American Journal of Clinical Nutrition in 2012, men within the healthy BMI range had body fat percentages ranging from 12 to 28 percent. Another way to check if you're at an ideal, or healthy weight, is to use your waist circumference. In general, a waist circumference measurement above 40 inches places a man at an increased risk for type 2 diabetes and heart disease. You can also take your waist-to-hip ratio into account. If your waist circumference in inches divided by your hip circumference in inches is higher than 0.8, then you could be at an increased risk for these health issues. The best screening tool for heart disease risk may be the waist-to-height ratio -- or WHtR -- according to a study published in Obesity Reviews in 2012. To calculate this number, divide your waist circumference by your height, both in inches. If they're at a healthy weight, men should have a WHtR between 0.43 and 0.52. 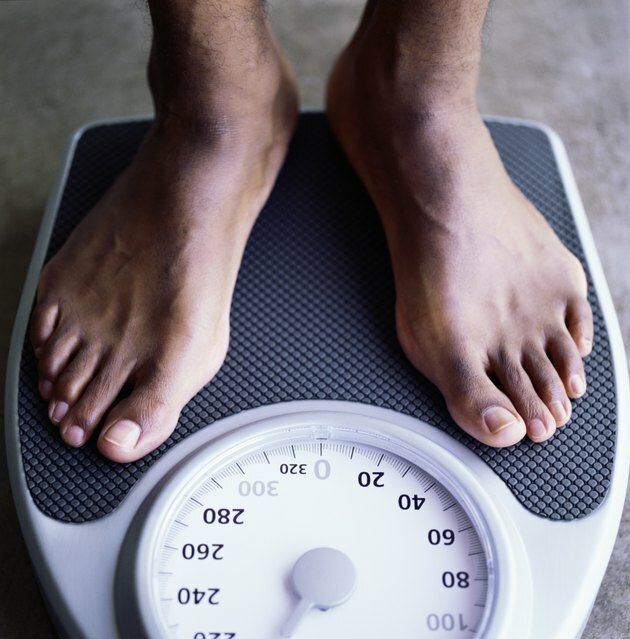 For a height of 5 feet, 7 inches, a healthy waist circumference is between 29 and 35 inches. If you're above your ideal weight, taking steps to lose weight at a healthy rate of 1 to 2 pounds per week can help you get back to a healthy weight and body composition. The best way to do this is through a combination of a reduced-calorie diet and regularly participation in both cardio and resistance-training workouts. A combination of dietary changes and exercising was more effective for weight loss than either of these methods on its own, according to a study published in 2014 in the Journal of the Academy of Nutrition and Dietetics. You'll lose about 1 pound per week if you cut 500 calories per day from your diet each day, and increasing to 1,000 calories per day helps you lose about 2 pounds per week. Cardio helps you burn more calories, while resistance training helps limit muscle losses so you lose mainly fat while dieting. Aim for 300 minutes of moderate intensity cardio and at least two resistance training sessions each week.